Gadgets can be really cool. But when they’re really cool and save a life, that’s even cooler. And when it’s based on technology from the movies, well, it doesn’t get much cooler than that. And even though this gadget looks more like Dr. Beverly Crusher’s Tricorder in StarTrek, it’s actually based on Academy Award winning technology from The Lord of the Rings Trilogy. Peter Jackson needed a better way to create the character of Gollum as he was unsatisfied with the way in which computer generated characters appeared and, more importantly, moved. He turned to New Zealand based WETA Workshop who developed a device that would use both motion capture and lasers to get an exact digital image of not only his body’s movements, but of the body’s density itself. The result was groundbreaking and Peter Jackson took home an Academy Award for Best Visual Effects. But in the real world, the technology has even more important applications. 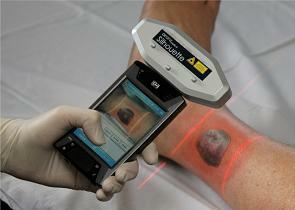 A handheld medical scanner, called an SilhouetteMobile, scans and stores information about a patient’s wounds – this includes the width and depth. This means that doctors and nurses can now track healing of a patient’s wounds over time and more accurately project how a particular treatment is working. In addition, eye doctors can use the technology to more accurately map the eye – which is very useful for lasik, glasses, and other opthomological treatments.